And Its PIPPA In Just Under The Wire! Pippa Mann, a 29 year old Indy Car pilot from London, England is about to embark on her second run at the Yard of Bricks in hopes of taking that famous swig of milk in victory lane. Pippa Mann today was confirmed as the third entry for Dale Coyne Racing, after a lengthy and exhausting search to complete a program (read: find a sponsor). Mann, who last competed in the Indy 500 two years ago was almost in a seat on Bump Day last year, but never got the call to suit up. 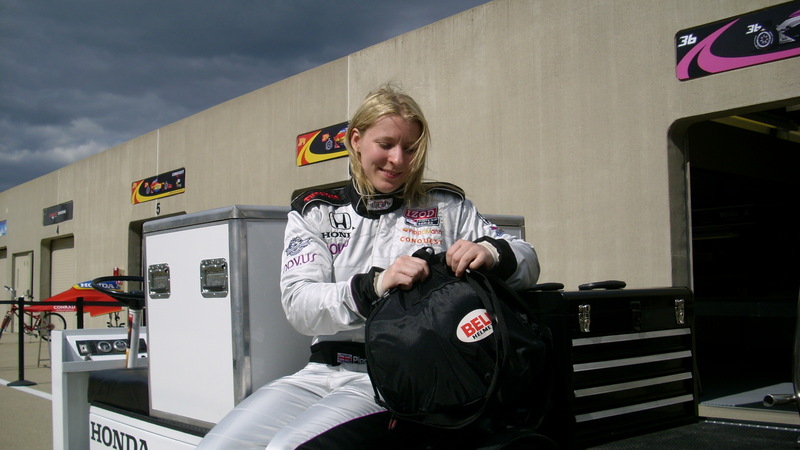 Pippa Mann was the first woman to win a Pole at the famous Indianapolis Motor Speedway. She also lead and won from the pole in one of her last races in Lights at Kentucky Speedway in 2010. A re you kidding me? Pippa Mann has been an UNSUNG hero and ambassador for IndyCar racing and open wheel racing in general. What do you do if you do not have a ride for Indy? You follow Pippa’s lead, get up and off your arse and go….. to…… work. You pound your feet on the concrete, you get up at 5am and hit the gym, you hit the concrete for sponsors some more, you help Glass Hammer Racing develop young ladies into race car drivers (in your copious amounts of spare time), and always find time to do show prep for her gig as a member of the Indy Lights broadcast team. In other words, this lady GETS IT. You do whatever it takes and, in amongst all of the turmoil that is ups and downs of sponsor search, Pippa found time to marry a gent we shall continue to refer to as….”Himself”. Not too bad for a lady that is, ah, shall we say, unemployed. My job search took me about 6 months; Pippa has been at this for two years and this is just at the IndyCar level, not counting efforts in years prior. So, once the excitement wears off, make sure to drop by the garage area and tell Dale Coyne, Thanks, man! He has made a ton of true IndyCar fans happy today! I cannot wait to get a picture of Pippa standing next to Justin Wilson. Should make for great optics! And to Dale, once again, my thanks, Sir! Thanks for stopping by and we will talk to you next time.